"For the first time since a long time, a Conservative prime minister of the UK is fighting for Europe and for the European Union," the president of the European Parliament, Martin Schulz, has told BBC HARDtalk's Sarah Montague. 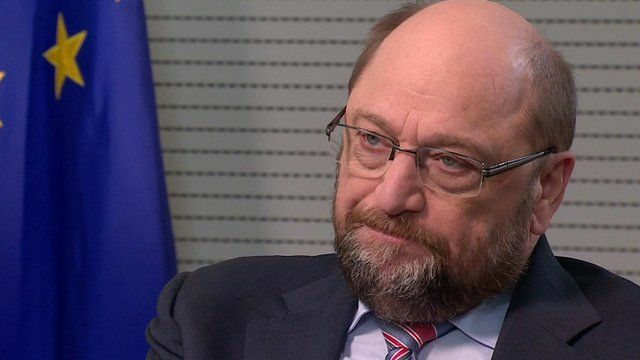 Asked about Conservative MP and Mayor of London Boris Johnson, who is campaigning to leave the European Union because he believes a better and bigger negotiation can be had, Mr Schulz said Mr Johnson was contributing to the clarification of the debate. "It is not about a Tory debate, it's about winning the confidence of British voters," he added. A UK referendum on whether to remain a member of the EU will take place on 23 June 2016. Watch the full interview on BBC World News and on the BBC News Channel on Wednesday 24 February 2016. It is also available on BBC iPlayer (UK only).